We are now nearing the end of Mercury’s Retrograde and feeling like the only way we made it through was a whole lot of patience and the power of healing crystals. One of our partners, Saffron and Sage, offers energy therapy that is out of this world. We consulted with them and they sent us the gift of the incredible crystal expert and reiki practitioner, Rachel, to give our staff detailed information about the crystals we carry and their properties. 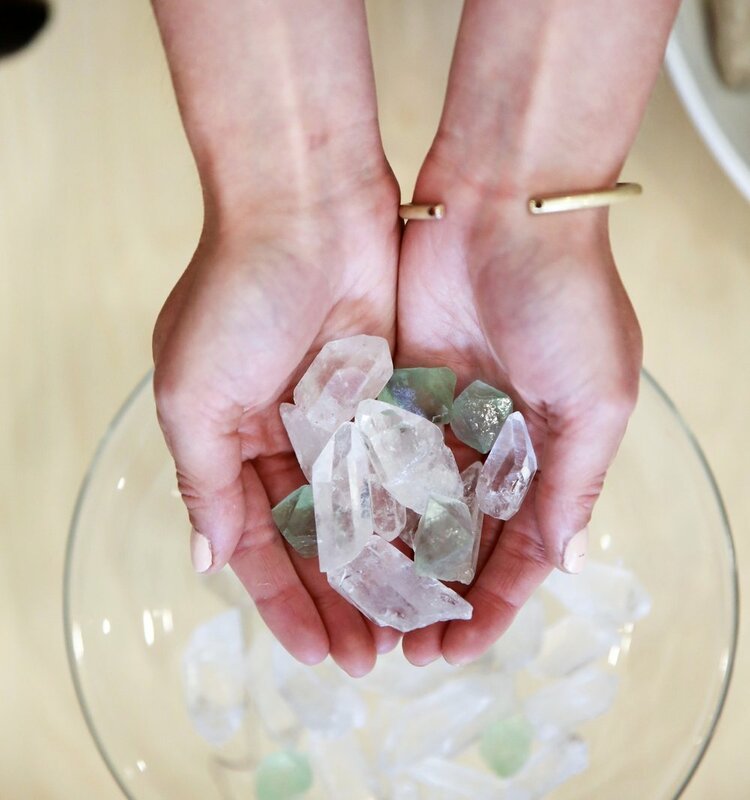 With all of the information we learned, we created a beginner’s CRYSTAL CRASH COURSE to show you all simple ways to use crystals around your home and how they can benefit you day-to-day! We decided to start with the five crystals we have in every one of our treatment rooms at Spa Kingston: clear quartz, amethyst, rose quartz, selenite and smoky quartz. Description: Clear Quartz is one of the most popular crystals for beginners! It is a key component to your crystal collection because it is the most versatile stone and it magnifies the vibrations of stones surrounding it. Clear quartz is even used to cleanse and re-energize crystals because of their powerful cleansing effects and the ability to counteract negative energy blockages. How to Use: Sit quietly with the stone and feel its white light fill your body with positive energy. Contemplate your intention for the healing crystal and trust in the power of its vibrations. Description: Amethyst strengthens intuition, protection, and balance. Amethyst also aids in reducing stress and finding peace and mental clarity. How to Use: Amethyst is visually gorgeous so it is an ideal stone to place around the home as décor! While focusing on your intention, place amethyst in your office or bedroom to emanate calming energies and invite in abundance. This stone also works well as a complementary healing tool in yoga and meditation because it boosts inner strength and provides spiritual protection. Description: Rose Quartz is commonly known as the love magnet due to the fact that it brings compassion, peace, and love into your life. “Rose quartz is a wonderful stone to heal and protect the heart, balance emotions, release stress and tension, and encourage love and self-esteem,” says model and skin-care brand founder Miranda Kerr. How to Use: Make a beauty water with rose quartz! Place a tumbled rose quartz crystal, filtered water and a handful of rose petals in a glass bowl or jar. Put this out in the sun for 4-8 hours to allow the crystals to energize and the rose petals to infuse into the water. Then, strain the water and use it to wash your face whenever you need a boost in the love department! Too much work? Try placing a rose quartz candle holder on your bedside table to bring love energies into the bedroom. Description: Selenite is another powerful cleansing stone because it ensures a positive flow of vibrations between you and other rocks in your collection, which makes it an ideal crystal for beginners! It is also protective and healing. How to Use: Quickly remove negative energy from the body and clear the aura around you by moving a selenite wand down the body from the top of your head to your feet. Repeat this cleansing ritual until you feel completely rejuvenated with positive vibrations. Afterward, you’ll have a restored sense of balance and the protection of a white light that connects you to the universe! Description: When life throws you shade, throw it right back with Smoky Quartz! This crystal is grounding, detoxifying and balancing. This crystal amplifies the truth of everything around it. The truth can set you free and the Smoky Quartz crystal provides the roadmap to get there. How to Use: Get the most out this master healer by taking a Smoky Quartz crystal point and placing it over areas of tension. Feel the stone and its healing properties infusing your body with a healing light that neutralizes negativity. You can also keep this crystal close by setting your grounding glass of red wine on one of our Smoky Quartz crystal coasters. Now all you have to do is get your crystal collection started and you are on your way to a more loving and positive path safe from negative energy and imbalance! *Original article from Spa Kingston.